G. Willow Wilson’s debut novel Alif the Unseen was an NPR and Washington Post Best Book of the Year, and it established her as a vital American Muslim literary voice. 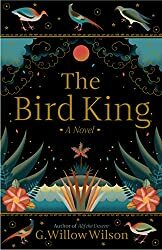 Now she delivers The Bird King, a stunning new novel that tells the story of Fatima, a concubine in the royal court of Granada, the last emirate of Muslim Spain, and her dearest friend Hassan, the palace mapmaker. Hassan has a secret—he can draw maps of places he’s never seen and bend the shape of reality. When representatives of the newly formed Spanish monarchy arrive to negotiate the sultan’s surrender, Fatima befriends one of the women, not realizing that she will see Hassan’s gift as sorcery and a threat to Christian Spanish rule.